This past Saturday, our CARE Team took its first trip to the Baton Rouge area to help with flood cleanup. For the 13 of us who went, it was a very powerful experience. We shared a little about it Sunday morning, but honestly, our stories and the few images we captured can’t even begin to do it justice. Driving into the disaster zone, you begin to see small indications that something was wrong: standing water along the roads, high water/mud lines in the trees and bushes. But when you get into the neighborhoods, it’s absolutely overwhelming. I shared a video of our drive down one of the residential streets. 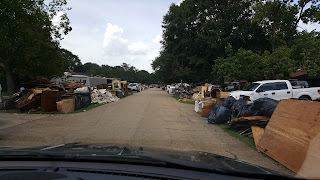 Furniture, flooring, toys, electronics… all destroyed by the flood water, all piled at the curb waiting to be hauled away. The piles were so high that it was difficult to see the houses behind them. And the piles seemed to be endless. Every turn, every street, every residence. At first, it was shocking to see. But after a while, you start to get numb to it. Another driveway, another mountain of trash. But each pile of “trash” represented a lifetime of things worked for, memories, comforts, everything that makes a house a home. When just one family loses everything they had in a disaster, it’s heartbreaking. We take notice. We feel for them. I can’t even count the number of times over the years that we’ve come together to help a family recover from a fire or a tree through their roof or some other unfortunate event. But when virtually everyone in an entire community loses virtually everything… it’s overwhelming. And this scene is playing out in countless communities in South Louisiana. It’s almost too much to process. 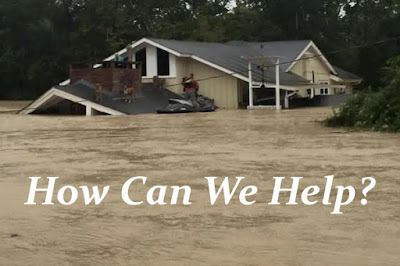 South Louisiana needs a LOT of help. More than any single church or organization could provide. The flooding in South Louisiana is not one single disaster. More than 60,000 homes have been damaged or destroyed. That’s 60,000+ disasters, because each family, each individual is dealing with their own significant and very personal losses. This past Saturday, our team had the opportunity to split up and assist 5 different families. Each of those families had stories that would break your heart. When you look at the big picture, helping 5 families out of 60,000+ seems insignificant. But for those 5 families, our presence meant the world to them! We made a difference. We’re going back again this Saturday, and we already have a wonderful team in place! If you’d like to join us, let me know on Facebook and I’ll share the details with you. I realize that not everyone can make the trip. Christian Challenge would like to send a group down every week for as long as we possibly can… but there will even be some weekends where I won’t be able to go. And while it’s wonderful if you can go, there are many other ways to help. And every bit of help is valuable! In 1 Samuel 30, David and his army were facing a crisis. He set off with 600 soldiers to rescue women and children who had been captured by the enemy. But it was a grueling mission, and 200 of the soldiers couldn’t make the whole trip. They stayed back and guarded the equipment. When David and the victorious soldiers returned, he gave instructions that everyone - even those who stayed behind - was to have a share of the reward. I’ve already heard stories of those who volunteered to babysit (or dogsit!) so that someone else could make the trip. (If you’re a part of Christian Challenge and want to offer to be someone’s sitter so they can go, please let us know in our Facebook group!) Still others have provided supplies for us to bring to those who need them, and tools for us to use as we serve in the cleanup, and refreshments that have been shared not just with our team, but with others who are serving or dealing with the cleanup themselves. As Paul described in 1 Corinthians 12, the body of Christ is made up of many members, and functions best when each one does its part! In addition, I can bring gift cards to give directly to those in need (whose needs have been verified by the churches we’re assisting). You can also donate money towards the purchase of supplies or gift cards. If you’d like to donate something that isn’t on this list, please check with other groups who may be better equipped to receive those kinds of items at this time (see the list from last week’s blog), or hang on to it for now. As many others have been saying, everything will be needed… but not everything is needed now! In the midst of such a tremendous natural disaster, it has truly touched me to see how so many people have been coming together to help. These last two weeks, I’ve been talking about what we as the Christian Challenge family have been doing, but I know that many other churches and businesses are also involved in flood relief projects. Let me know what you’re doing in the comments so we can encourage one another! What we did this past week reminded me of the story, inspired by the 1969 essay by Loren Eiseley, called The Star Thrower. While walking along a beach after a storm, a man sees a boy throwing starfish back into the ocean. When asked what he’s doing, the boy responds that if the starfish aren’t returned to the ocean, they will die. The man comments that there are thousands of starfish and only one boy so how can he make a difference? 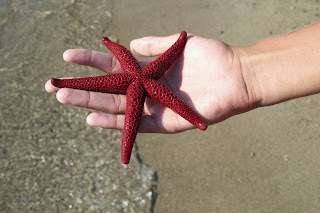 The little boy picks up a starfish and says, “I can make a difference for this one.” Truly each of us by making a difference for one starfish can make a difference for our world. There are some weeks when I’m not really sure what topic I should cover in this blog. This isn’t one of them. Over the weekend, nearly unprecedented amounts of rain fell over South Louisiana, leading to what’s now being called a “1000 year” flooding event. Entire communities are under water. 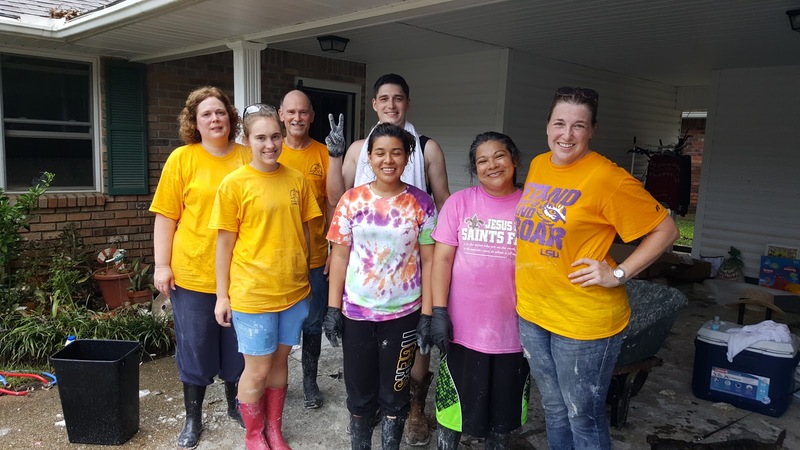 In Ascension Parish (in Louisiana, we call our counties parishes), nearly one-third of all homes have been flooded. Over 40,000 homes have experienced significant flooding. And there’s still more rain coming. Of course, you might not know this if you’re watching National news channels. While the floods have been mentioned, the coverage hasn’t been proportional to the size of the disaster. It seems like mainstream media is more interested in “extreme vetting” than “extreme flooding.” And that’s sad. This is a natural disaster of historic proportions. Several members of our church have relatives who have been impacted by the flooding. And even though we only received a fraction of the rainfall that our neighbors to the south experienced, the rain totals from this storm alone exceed our normal average precipitation for the entire month of August! As a result, we’ve had some weather related issues of our own - mostly minor flooding and sewer backups - but nothing like what’s going on just to our south. 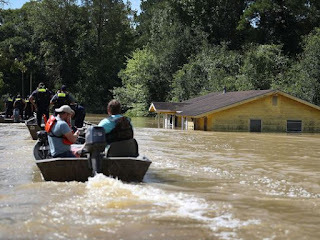 In the midst of this tragedy, there are also stories of neighbors helping neighbors, private citizens - who have dubbed themselves the Cajun Navy - have rescuing others from flooded out areas with own boats and high-water vehicles. There are stories of people who were displaced and went to a Walmart to buy necessities… and the person in line behind them paid for it. Sayes Office Supplies has already sent one truck full of donations to help those who have been flooded out of their homes. I’m grateful for every story of compassion and generosity - those stories warm the heart and keep hope alive. Reach out. 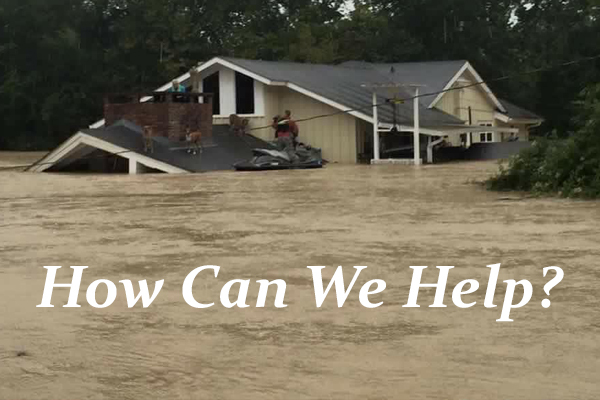 If you live here in Cenla and you don’t personally know someone who has been directly affected by the flooding, you certainly know someone whose family has been impacted. There are thousands of displaced individuals who have made their way to central and northern Louisiana to stay with extended family. Be a support to those who are hosting flood victims. Prepare/Share. Set aside some money if you’re interested in sending financial or other forms of material support. Gift cards (for large retailers like Walmart or generic Credit Card gift cards) can help families get exactly what they need when they need it. (If you bring them to the church, we will make sure these go directly to families we have a connection to that have been affected.) You may also want to talk to your employer about the possibility of taking time off to serve in the cleanup efforts. Join. Be a part of what other organizations and businesses are doing to provide relief to flood victims. It will take the combined efforts of many, many groups to help the affected areas of South Louisiana get back on their feet. Give grace. Those who have lost everything have a difficult road ahead of them. They’ll be hurting and frustrated. They’ll be navigating a labyrinth of insurance and government paperwork and red tape. Unfortunately, they might even find themselves the targets of scammers. So be gracious, especially when folks are flustered and upset. 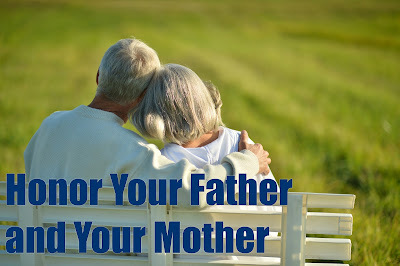 Avoid throwing around Christianese platitudes. That doesn’t help anyone. I’ve asked our members to let me know about relatives who have flood-related needs. After the water recedes and these families are better able to assess their needs, we’d like to organize some CARE Team trips to assist them with cleanup. There’s an inner-city church in Baton Rouge that CCI supports as part of its regular missions giving. We’ve reached out to them to see how the church itself or its members have been impacted, and/or how they might be reaching out to their community. This could provide another avenue for us to plug in and provide relief. 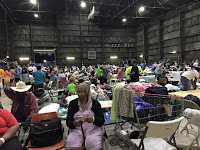 https://louisianabaptists.org/disasterrelief - We are not affiliated with the Louisiana Baptist Convention/Southern Baptist Convention, but they are doing great work! 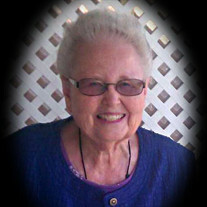 Member churches in the disaster zone are serving in the relief efforts and in need of volunteers. 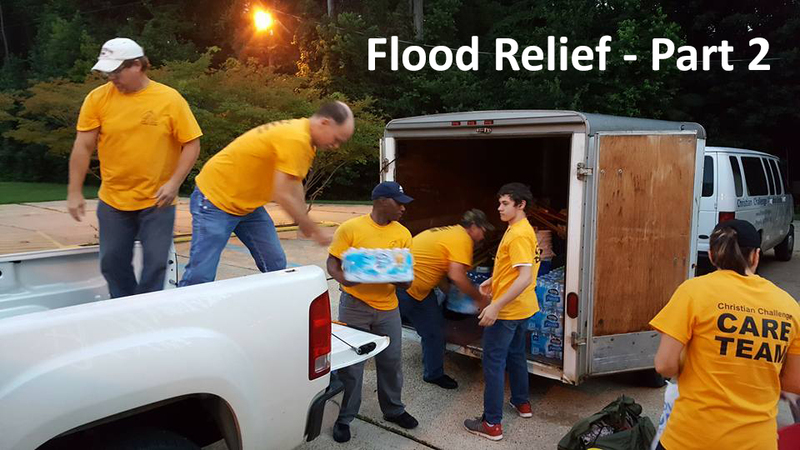 https://www.facebook.com/First-Baptist-Church-Pineville-48777570770/?fref=ts - The members of First Baptist Church here in Pineville have been organizing trips and supply runs to assist relatives & friends of their congregation. http://www.redcross.org - Among other things, the Red Cross helps with temporary shelters and meals for displaced residents. 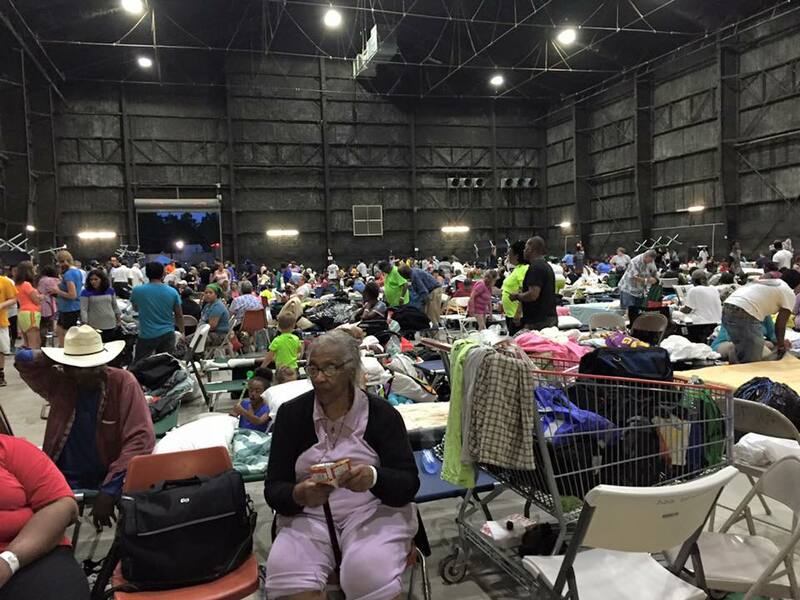 http://www.salvationarmyusa.org/ - The Salvation Army is often the first relief organization to arrive in the wake of a disaster. Christian Challenge supports our local branch of the Salvation Army year round, but they could certainly use some extra help right now. We’re going to keep you posted on our ongoing efforts via my Facebook page, the Weekend Update, and our church bulletin. I’m grateful that Christian Challenge is a church that loves God and loves others, and is willing to do things in a tangible way. I love serving Jesus with you!